Look at your two. Aren’t they cute? Aren’t they getting a bit easier now they’re that little bit older? Wouldn’t another one be nice…? If your mind is currently at this dangerous stage, congratulations! 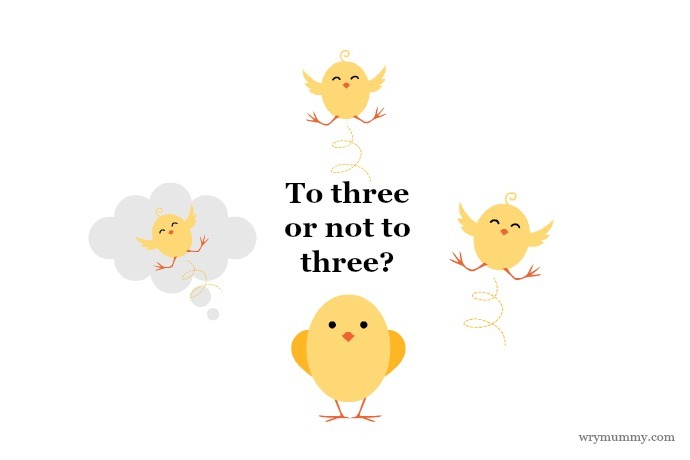 You may soon enter the world of Three. Just be aware of a couple of things first. Two into three does not go. There will always be one child left unmarked while you and your partner deal with the other two. This “rogue child” will create more mayhem than you thought possible while left unsupervised. Particularly noticeable at bedtime. You will ignore your third most of the time. Especially as a newborn when they sleep a lot and can easily get completely forgotten about. In a house of three, he who shouts loudest, wins, and the youngest often doesn’t get a look in. You’ll need a bladder of steel. Both to carry a third baby and then after s/he’s born. Two nappies to change plus a child to help to the loo is quite a challenge when mummy needs to go too. You only have two hands. Well, duh. Two hands cannot (easily) hold three children. You will have to step up your powers of remote control over the older two siblings to keep them safe on roads / out of the biscuit tin. You will find yourself bleating, “I only have two hands” several times a day. To deaf and unsympathetic little ears. Your life will become an endless game of fox, chicken and grain. Strap baby in his carseat while the other two wait in the house and take their shoes off again. Put toddler and older one in car, baby has done a poo. Go back in house to change baby. Other two start braining each other and set off the car alarm…You get the picture. But you don’t get where you’re going on time. Ever again. You’ll never get your kids’ names right again. There must be some algorithm for this, but you always say the wrong two names first. And then they see you are weak. Public places of interest will be a no-go for years. Large open areas are bad enough with one bolter, let alone three. Unfenced parks, the zoo, museums or any such like become out of bounds unless you have an ally. Supermarkets will not welcome you. Aisles are just not big enough for both a mum with three kids and two trolleys, and all the local mean people. People will think you’re mad… Both when you are pregnant and after. They will not be afraid to tell you this. …You will agree with them, much of the time. There is never a moment when someone is not saying, “Mum!” Someone, somewhere will always be asking for something. You will be torn in three directions and wonder what is left. Someone, somewhere will always be fighting. It is the universal law of siblings. No one will help you. You brought it on yourself, lady. Not realising what the jump from one to two would be like is fair enough, but subsequent children? You knew what you were letting yourself in for. Deal. No one will invite you to anything. They have seen your house. They do not want theirs to resemble it. Holidays will become ridiculous. Planes, trains and hotels were not created with families of five in mind. One of you (and it will not be you) will always be sat behind while the other one manages all the children. You will cram into one hotel room until they are ten, because you don’t want to pay for two rooms. You will always be disappointing one of your children at any given moment. It is the universal law of parenting three. You will cope. Just as your capacity to love simply and miraculously grows with each child, so does your capacity to cope. My 3 boys are 2, 4 and 6 and this post made me smile, especially about getting out the door. I also hated squeezing 3 car seats into a car and getting soaking wet strapping them all in if it was raining. Thank goodness the older 2 do it themselves now! If I also had a pound for every time someone said to me ‘you’ve got your hands full’ when out in public! I had six. A long time ago. I am still too exhausted to write more here. Except, great post, as ever. All so very true! It is exhausting and relentless. I remember the stares I got walking along with a baby carried on the front of me and a small boy on each side. Was I mad?! Probably. You’re right, life is hectic with one child, let alone two, three and more. I don’t mean to put you off at all – tiny babies are the best. And so are the children they grow to be. That is a very good way of looking at it Rebecca! At least you’re never lonely or feel like no one needs you. Good luck, you will love having three!